It is so beautiful!! I knew it would be cute, but you really made it even better than I thought it could be. She will love it!! I am sending people to you! I LOVE the quilts and can't wait to give them to my girls for Christmas! Thanks again. The quilts arrived yesterday, but my daughter was home for the weekend, so I just had an opportunity to take a look at them now. They are beautiful!! I have such mixed emotions however. Right now, I am feeling sad as they remind me so much of my husband and how much we all miss him. But I know, in time, they will be a comfort to us. I am not sure if I am going to be able to wait until Christmas to give them to my children, I may surprise them at Thanksgiving. I will certainly pass along your name and contact information to others looking to do something similar. Hello Betty. My t-shirt quilt arrived yesterday and it?s beautiful! I love it and my daughter will too. You really do produce a top quality product. You should be very proud of your work. Thank you so much. I LOVE the quilt!!! I have posted it on my Facebook page with your business name so I'm sure you will be getting some calls. Thank You!!! 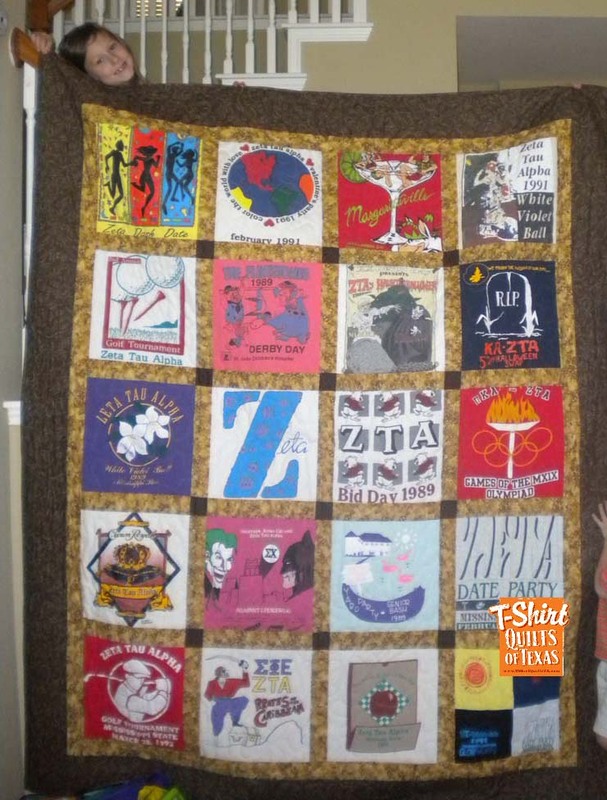 Betty, Thought you might enjoy seeing for whom you made this fabulous tee shirt quilt. In the picture, that's Adam & me.? 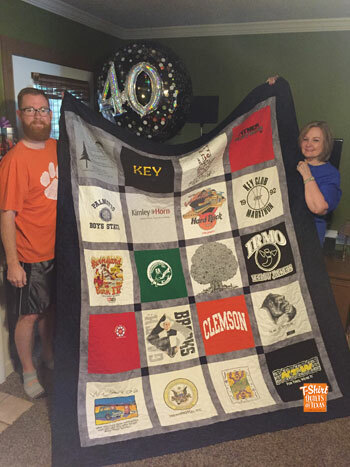 After we looked at it and were thrilled beyond expectation, we repacked Adam's quilt, rolling it up with the 'Happy 40th Birthday' label visible on the top.? When he opened our gift, Adam smiled but his look was a bit quizzical.? As he unrolled it, he was very surprised.? He had no idea that I had saved these tee shirts from his high school days. Adam spent time looking at each tee, remembering its significance in his life.? His children enjoyed hearing stories they had never heard before (some stories even I had never heard). Thank you for your exceptional transformation of tee shirt memories. Don't think we could have given Adam anything more special to mark his 40th Birthday. Ma'm the quilt made it with no problem and my wife was absolutely blown away!? Just wanted to say thank you for the amazing work and customer service. Betty, The quilt is beautiful! Thank you so much! 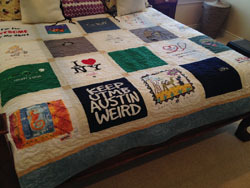 Many thanks to you and your team at T-Shirt Quilts of Texas for making the quilt for my son, Jonathan. It arrived in the mail and it looks wonderful. Please pass along our thanks to all the hands that worked on it. They did a great job! I received my quilt today. It was an emotional moment. It is more than what I anticipated. Its beautiful and so endearing to me, truly well worth the wait. Thank you so much, I will highly recommend you to all I know. Quilt arrived. It is AMAZING!? Thank you thank you thank you!! IT CAME TODAY! It's beautiful!!! Thank you so much Betty-what beautiful work! with the way it turned out. Thank you for a job well done. I will definitely be sending more t-shirts in the future. Thank you from the bottom of my heart. You put my t shirts together better	than I could have. The aesthetic is beautiful with dark squares on the	conners, white shirts scattered as were the light blue, so it balances	well. We felt like we were reviewing part of our lives. Obviously opera,	politics and the UU church as well as adventurous travel consist of what we	have done in the past 20 years. The one problem we had was whether we were	willing to bring friends and family into our bedroom or could we hang it in	the living room at least for awhile. Len thought it too beautiful to sit on	our bed. I told him the t shirts all washed well so I assumed the quilt could be washed too. Thanks again. 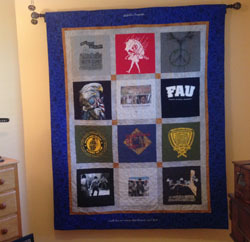 I absolutely love the quilt you made from the tshirts I sent you.? It was everything I had hoped and is for my sons's 13th bday. Thank you! I recieved my quilt yesterday! Oh my gosh it's so amazing. Thank you so much. I couldn't have asked for a more beautiful piece of work. You are truly talented. Thanks for sharing your craft and skill. I'm currently saving all my sons Star Wars tshirts, as soon as I have enough he has grown out of I will be using your services again. Received the blanket today. My daughter is going to love it. Will be showing lots of people your fine work. Thank you. Got it and it looks amazing!! Couldn't be happier with it. My mom wants to have one made for my brother next year when he graduates, so I'll be sure to give her your card. I have had more people compliment the quilting that you have done on the quilts so its fun to do them and see how they'll turn out. It's absolutely beautiful ! Thank you so much . It's everything I hoped it would be for them ! Hope to do another with you soon ! Thank you for taking such good care of me and the quilts. It makes it so much easier knowing I can bring you a bucket full and it's ok. And I've got a bucket full tomorrow to drop off. ... My daughter absolutely loved the first quilt! Thanks again! I received the quilt yesterday and? it is great. The colors you picked are perfect and the layout looks wonderful. I was a little apprehensive about the marbled fabric, but it looks like the ocean and that is my son's passion - couldn't be any better. I can't wait to give it to him for his birthday next month. - couldn't be any better. I can't wait to give it to him for his birthday next month. The quilt is fantastic! Thanks much. THIS IS AWESOME _ CAN't WAIT TO GIVE IT TO HERE!!! I just opened the box and pulled out my daughter's t-shirt quilt and it is wonderful!!! You did an amazing job on it and I thank you so very much. I can't wait to show it to her tonight! 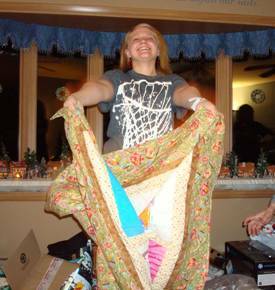 I just wanted to let you know how thrilled I was with my quilt! It looked amazing, you did a fabulous job...my brother (to whom the quilt was for) loved it. Thank you so very much. Hello Betty, I received the quilt yesterday. It is beautiful! You all did a wonderful job! I received my quilt already....it is AWESOME....so happy with it...Thanks so much! The quilt is beautiful, and Kerrianne really loved it. I was so excited to see how her family reacted, and I can't think you enough for handling this. I will be in touch later to have my husband's done, and feel so comfortable that you will take care of everything. . Hugs to you from Virginia. I wanted to let you know that my daughter Valerie cried when she opened her quilt on Christmas morning. She thought it was beautiful! Thank you so much!? I have another daughter that I wanted you to make a quilt for, they live out of town her husband is in the military at Ft. Polk, LA. She will be coming to visit sometime in February, I was wondering if I could bring her (16) shirts this week so you could start working on her quilt. Most of the shirts are her college shirts from Texas A&M. I can't thank you enough for the beautiful work you did on my sons memory quilt. It is so gorgeous and so much more than I could ever have imagined. We brought it up to Canada this weekend and he was really thrilled and touched by all his t shirt memories. He said all the other guys think it's the coolest gift and they really like it. Before we left for Canada I brought it to school to show some of my friends (I am a teacher). My friends could not believe how great the quilt was and the quality of your work. Thanks so much. You helped me give my son nick a very special gift that he will treasure. I am giving out your website to the many friends who have asked for it thanks again! Hi Betty, We left town for the Holidays and just returned today and found the quilt waiting. It is absolutely beautiful and exactly what I had hoped for! Thanks again for creating a beautiful quilt that my daughter will have for many years. Betty, We received our blanket? Saturday before Christmas and was so pleased!? The blanket is beautiful and the timing of its arrival was perfect!? Thank you so much for all your hard work to finish our blanket in time for Christmas and for the truly beautiful quilt!? Our daughter loved it and is so excited to take it back to school with her! Hope you were/are able to enjoy a few days of relaxation this Christmas! I know you worked hard for our family! Hi, Betty! We received the quilt a few days before Christmas and it was such a big hit for my husband! It is beautiful and so big and comfy!!! The first thing he did after he looked at it was curl up and take a big nap. Thank you so much! It is exceptional quality and the colors are perfect! Thank you so much, Betty. My husband opened up his gift today and loves it. It is gorgeous. He is already thinking about the next quilt. I received the quilt yesterday. It is beautiful! You all did a wonderful job! Merry Christmas!!! Again, LOVE LOVE LOVE the quilt. I meant to ask you about washing instructions. Is it easy to wash or should we spot clean if needed? Betty, I just wanted to let you know that the blanket you made is wonderful. It far exceeded my expectations, and surpassed anything I could have hoped for. My wife's first comment was the quality of the workmanship and how well the blanket came together. She told me that just looking at the it reminded her of all the places we had been, and the memories of our time across the globe. For that I couldn't be happier. From a bunch of T's packed in a box under the bed, to something that reminds us of the fun we have had together makes it worth every penny. I intend to bring it into work and show it off, so I hope that turns into some future business? Betty, I meant to email you a LONG time ago, but completely forgot. The Tulsa quilt looks amazing!!! I am so happy with it. Everything is perfect! Thank you so much for your wonderful work, my quilts are some of my favorite things now! ? Got my quilt yesterday -- thanks a ton! It is great and the quality is beautiful. Thanks so much! The quilt was perfect! Thank you:-) Many who saw it took a business card. Got my quilt. It is absolutely all I hoped it would be. The music print backing fabric is the perfect choice. The quality of workmanship is excellent. I couldn't be more pleased. Thank you so much! Mom was so happy with the way they [the two quilts] turned out. Thank you!! Just wanted to let you know we got Katrena's softball quilt Friday. It is beautiful! I have been recommending you to all of her teammates and our friends. The stitching is superior. You did a wonderful job! Thank you! OMG!!! I just opened the box, and the quilts are WONDERFUL! I was so afraid about sending my kids' shirts through the mail. You were wonderful on the phone, and held my hand - long distance- all the way. I am so pleased and can hardly wait until Avery and Matthew open their gifts. I know they will forgive me for those 'little white lies' about what happened to their shirts. I'll be sending Jacksons shirts when he graduates. Just wanted to say Thank You very much for making my nieces T-Shirt quilt!!! I just finished pillows to match, with Diana's help!!! Got it all in the mail for her birthday!!! We watched her open via Skype it was so much fun, she loves the quilt!!! In the first picture you can see me in the top right hand corner finishing up the pillows!!! P.S. I put you on my face book. Betty, I saw the quilt you made for my friend, Suzanne G.. It is a lovely quilt. You did a great job. She really likes it too. Very nice!??? exceeded my expectations. was fun to unfold and see the? Love it! 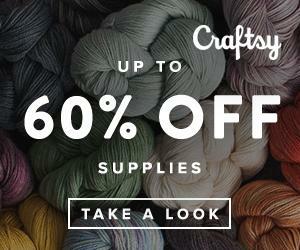 Great colors?great layout of shirts?great craftsmanship! Many, many thanks. It will be an awesome Christimas present for my daughter. The quilts are here. Great job. I love them. I received the quilt today and it more beautiful than we imagined. It is for our 15year old son who is handicapped so when my husband and I? held it up to look at it we were both speechless and smiled at one another knowing how much Preston will love his quilt when he opens it on Christmas. Thank you so much. We will be passing out your cards. I just received the quilt. It turned out really nice. I know Lori is going to love it. Thanks! I received the quilt yesterday and I LOVE it!!!? What a treasure!? Thanks so much! Ms. Baker, I got my Quilt in the mail today and I just love it. I wanted to ask you if you can make quilts with pictures and how big does the pictures have to be? My daughter has two Chihuahua's and would love to have a quilt with their pictures and some of their little clothes on it. Would it cost the same as a t-shirt quilt? Wow, the quilt is amazing. Much better then I anticipated! Thank you very much and I will pass your cards along. I may already have a order for you! I received Matt's T-shirt quilt in the mail yesterday. I am so very pleased, it is beautiful! You did an outstanding job. I can't wait to give it to him on Christmas. What a wonderful keepsake. Thanks again! I LOVE the quilt!!! It is more beautiful than I could have imagined. Your pictures don't do justice to the quality that you produce. Your skill and attention to detail is quite evident throughout. The way you joined the front and backs of the shirts, I just can't believe how nice they look. Thank you again. My quilt arrived today and it's just beautiful! Thanks again, so much!!! Betty, Just sent the T-Shirts in a separate box. Last year you made me a quilt that I LOVE, so I thought I would do my sorority T's next. Please call upon receipt to discuss the details. Hi, I received the quilt today, and as before, it is just beautiful. I can't believe it! The quilts you made for the boys are awesome!. I hope you don't mind, I gave your card to some friends. You should be hearing from them in the next week. We are really enjoying the quilts. You do such nice work; I just HAD to do some more. :-)? This time, there will be six. 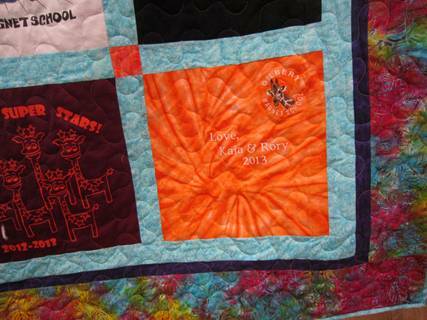 Betty, We received the quilt on Saturday and we love it. You exceeded our expectations. The quality of your work is superb! We know that our daughter will cherish this memento of her college years for a long time. I got the quilt today!! I LOVE it! It is very hard for me to not show it to him this morning! =)? I can't wait to show it off. Thanks again for squeezing it in between grand babies!? Betty, I received the quilt on Monday! It is absolutely perfect and beautiful! I really exceeded my expectations! Thank you so much! 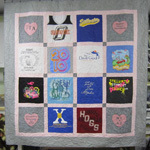 I will recommend you to anyone interested in a T-Shirt Quilt! 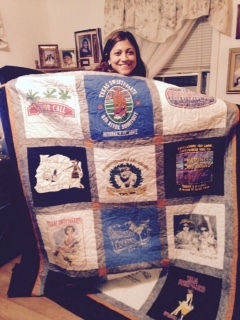 thank you betty..i received the quilt today and it is wonderful. it is a present for me and my partner for our 18 mo anniversary and to commemorate our upcoming move from california to oregon. it turned out really great and was a big hit. i thank you for following through even with the sadness you are experiencing. i really appreciate it and will enjoy the quilt for many years. thanks again and i will pass out your cards and keep you in mind for future projects. A few years ago my girlfriend got me a t-shirt quilt that you made for Christmas and now I want to surprise her with one of her own. At the moment, we are living in Dallas, but we will be back in Houston for the holidays. My question is if I send you the t-shirts for the quilt, will I be able to pick it up from your house and save on the shipping? Thank you for your time and consideration. I love the quilt you made me and I use it every day. Thanks! Thank you, Thank you, Thank you, Thank you, Thank you,Betty!!! I surely will let you know when I receive it. I know I will love it and I know I will send business your way. Also, my youngest child will graduate in 4 years. I just received our quilt yesterday and all I can say is "WOW!" We were so impressed with how it turned out. I can't wait to see the look on the young mans face when he receives it as his graduation gift. He loves his Notre Dame T-shirts so much; that's all he wears. Now we can truly appreciate them for many years to come and even save them as an heirloom. Thank you for such wonderful ideas and beautiful work. I received the quilt today and it looks just great as you said! Thanks again for the excellent work! Hey Betty, just wanted to let you know that my parents LOVED their quilt. Betty, Just wanted to tell you the quilt was great! Thank you. We all cried when Trish opened it at Christmas! That was a first for us because it was so special! The ordering process was easy, mailing the shirts was easy and Christmas shopping was easy. The boys loved their quilts, and they haven't stopped talking about them! Just received the 2 quilts you made for Janice and Mark. The colors you selected were perfect! I know they are going to love having these high school keepsakes. Now, I just need to get them through college! Ha! Wow! What great service and a wonderful quilt. The blanket turned out even better than I had hoped. Thank-you for turning our memories into something wonderful for us to treasure. Thanks again. ..... I have to tell you though that [the girls] loved the quilts! Haley said it was her best gift! Devon said she had always hoped to have one made at some point in her life! It was the last thing they opened on Christmas Day! Thanks for making me look good! 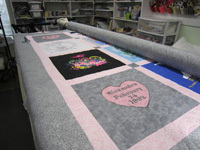 I hope the new year brings you a lot of business because you do such a wonderful job with your special quilts! Happy New Year! My daughter loved her quilt!! The workmanship is outstanding. I have included a picture for you of her opening it at Christmas. OMG! I received my quilt the other day and it is AMAZING! I absolutely love it! It is perfect! Thank you so much! I will definitely send business your way! Just wanted to let you know I got the quilt today! You did a awesome job! Betty, I got the quilt. I love it. Now I want one of my own someday soon. Thank you so much. Ill let you know what my sister says when she sees it - but I know its a going to be a hit! Just got the quilt today - it looks great! I can't wait to give it as a gift and will definintely be in touch in the future with any other quilting projects. Omigosh Betty! I just this minute opened the box you sent me and I am speechless (partly because my daughter is still sleeping), but I had to wait until she wasn't awake and I could look at the quilts without getting dog hair on them. What a beautiful keepsake you have created for each of my girls! Now they can't fight over one getting something and the other one not! I absolutely love them....the design, fabrics you chose and your craftsmanship! It's going to be hard to keep them under my hat, but it will be worth it. They don't like to be groomed first thing in the morning when they open gifts....so I'll try and get pics of their reactions to send you. I can't thank you enough! I'm going to have a smile on my face all day today, and then some! Have a great day and thanks for getting the hectic shopping season started in the right direction for me! Received the quilt last week and I LOVE IT!! Thank you so much for the quilts they are beautiful. I will take a picture of my daughter when she opens them up and send one to you. yes it arrived on Friday and I just opened it. It's just beautiful! Thank you so much for all your work. I know my son will love it. I went online to Paypal today and sent the money for the quilt. I just wanted to let you know that I absolutely love it. My daughter cried when I gave it to her. I've told so many people about the great job you did!? I will be using you again one day. Thanks again for working with my timeframe and coming through for me. Blessings to you and your business. I got the quilt and it looks great! You did an excellent job with the layout and the color palette. Its better than anything I imagined. My wife is going to love it. Just wanted to let you know my daughter was home this week and we got our first look at the quilt (I waited for her to open the box). She was thrilled with the results and loves her new quilt. Thanks so much. Betty, I got the quilt and it looks great! You did an excellent job with the layout and the color palette. Its better than anything I imagined. .... I just wanted to let you know that I absolutely love it [the quilt]. My daughter cried when I gave it to her. I've told so many people about the great job you did! I will be using you again one day. Thanks again for working with my timeframe and coming through for me. Received the quilt last week and I LOVE IT!! Thank you so much!! Betty, I can't tell you how happy I was to find you in the neighborhood. 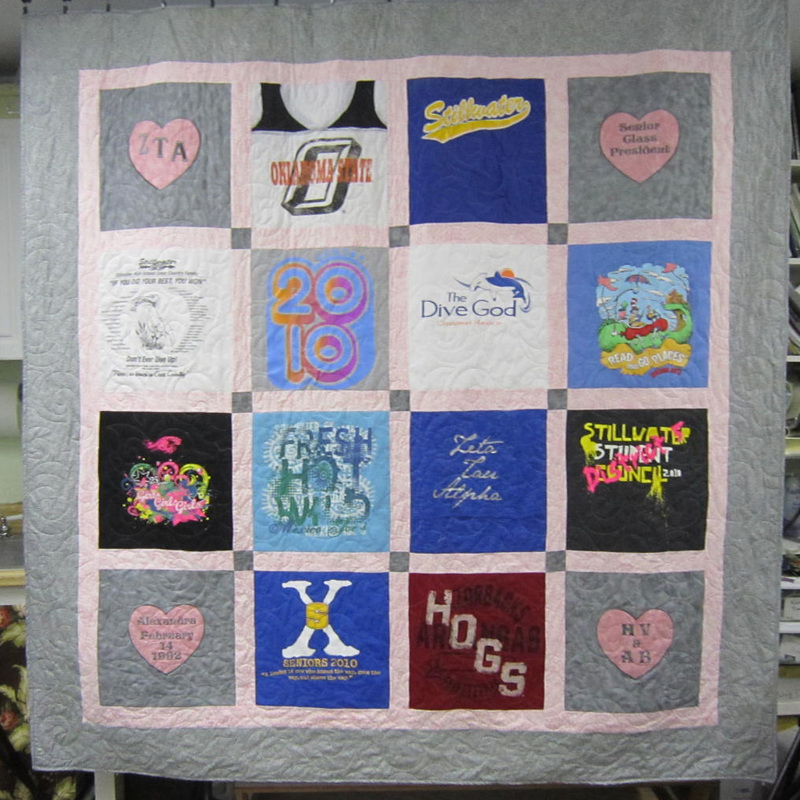 I know you had lots of quilts to get done for graduation and was so very pleased with the quilt that you made for us. Michelle loved it and has been showing it to her friends. I'm sure they will be calling you soon. Oh Betty - the quilt is awesome! Jim had been looking for his shirts, and as you know, I was a little worried that he was going to be upset. Have to tell you that he is thrilled with it and has shown it to everyone who has walked in the door! Janice graduates next year, and I'll get her shirts to you in plenty of time for her graduation. Thank you so much for getting the quilt done for our anniversary. Jack was so surprized when he finally recognized his t-shirts in the quilt. The look on his face! At first, he ran to the bedroom looking for his shirts. As I had mentioned while in your studio, he hadn't even missed them! LOL- He loves the quilt, and assures me that he will get over having his favorite t-shirts sacrificed for the quilt. Our daughter Amber, graduates in June, and I will get her shirts to you ASAP! This is a keepsake I will always treasure. I really appreciate how you kept me informed throughout the process of making my T-shirt quilt. Hi Betty! I just wanted to let you know that I love my quilt! It is just beautiful! You did such an amazing job. I couldn't have imagined it turning out any better. As soon as my dad picked it up, he called and told me how wonderful it looked and then teased me that I wasn't going to get it for Christmas. I was surprised by how happy and emotional I was when I opened it. It is such a wonderful way to "preserve" all those memories from my otherwise not wearable t's. Thanks so much! Just got back from the mailbox and tore open the box! 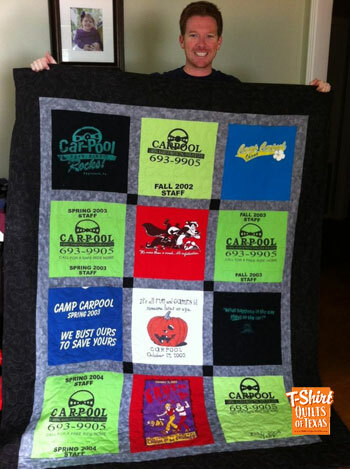 The t-shirt quilt is awesome! My daughter is going to LOVE it and I'm not sure I can wait until her birthday to give it to her! The Georgia Tech fabric around the outside totally makes the quilt and it will be a memento she will treasure for a long time. Thanks so much! Oh, I have to tell you this about the quilt you quilted for me. I gave it to my MIL and she just loved it. She goes to the library there in Choctaw [Oklahoma] several times a week and has read every book they have on Oklahoma history. She took the quilt to show the librarian and they wanted to keep there on display! It's been there since right after Christmas. Everyone who comes in makes a comment about it ? we are famous! And your name is also on the label. Just thought you would get a kick out of it. Thanks again for the awsome quilting you did on my Santa Quilt. When I showed it to my family last night, they couldn't get over how beautiful it was. I think I might even enter this in our next quilt guild show. Betty, he loved it and so did I. thanks so much. I've sent you a couple referrals! Just wanted to let you know that Shannon went nuts over her quilt. All the other grandkids were quick to let me know that they expect one, too! With 9 of them I'll probably barely be able to sit at the machine by the time I get to the smallest kid! Attached is a picture of Eva's (my 2yr. olds) room, which was recently completed. I must have had this in mind when I told you the colors for the quilt! The quilt is truly lovely and I can't wait to use it! Subject: Thanks for the assist! Just a note to thank you for the wonderful quilting job you did on my Margarita-Ville quilt. 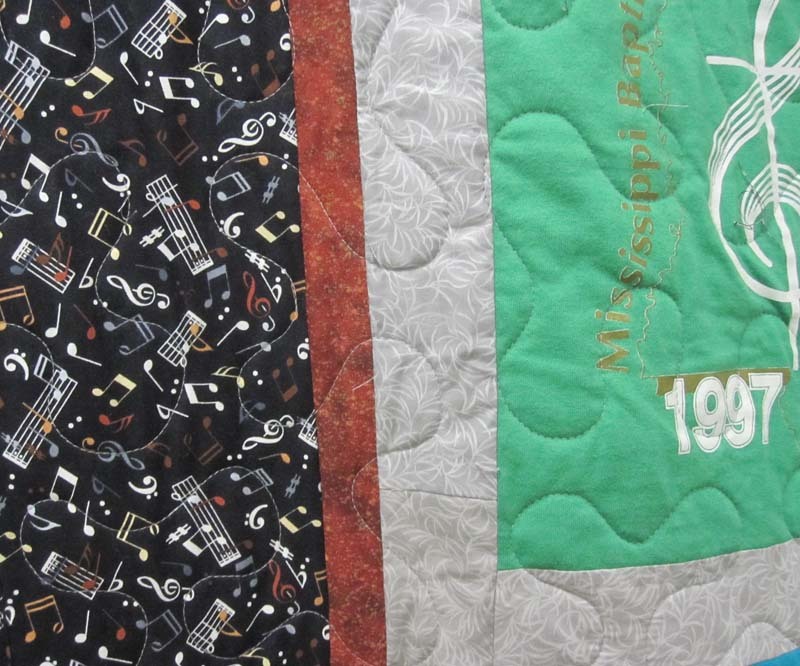 Imagine my surprise entering this quilt in my first quilt show and a winning ribbon! Your quilting was a big part of that win. You took the time to make sure the quilting enhanced the quilt and the multicolored thread you chose was prefect. Again thanks for the assist in getting my first quilting ribbon! Thanks you, thank you, thank you. The quilt is gorgeous!!!!!!!! Take lots of pictures at the quilt show. 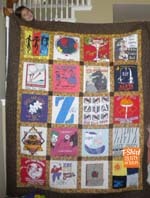 I want to see all your quilts that won prizes. Thank you again for the beautiful job that you did on my daughter's quilt. I sure hope I win some of your gift certificates at Quilto this month!!! have to add the baby to the quilt somehow. Take care and enjoy this gorgeous weather. Mrs Baker, you and Lindsey are the best! I can't believe you turned all those ZTA (Zeta Tau Alpha) t-shirts into such a beautiful quilt. You even found the pink & white polka dots fabric for the back. I absolutely love it. We will treasure it forever. LOVE My quilt. Such a cool quilt. Keep Austin Weird! THIS IS AWESOME _ CAN't WAIT TO GIVE IT TO HER!!! I had to write and tell you what an incredible job you did on my daughters quilt! I was sooo nervous when I opened the box and did not know what to expect. The grey material you used as backing was so beautiful and grey is her favorite color! It was just exceptional. I actually cried when I spread it out and saw how you made it exactly as I requested plus some. The heart corners with the embroidery were exceptional. Again thank you so much and she loved it! it was perfect. Thank you so much. I hope you take pictures of your finished works because I think it is the best one I have ever seen!